Petaloo is celebrating pet days. It's part of their nature after all...being a company named for pets... PET-aloo. 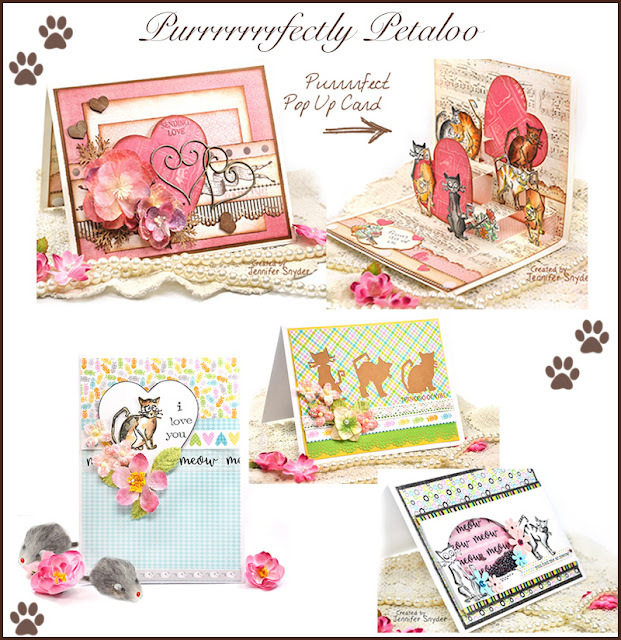 There are prizes that can be won for participating so check it out at Petaloo's blog right here. 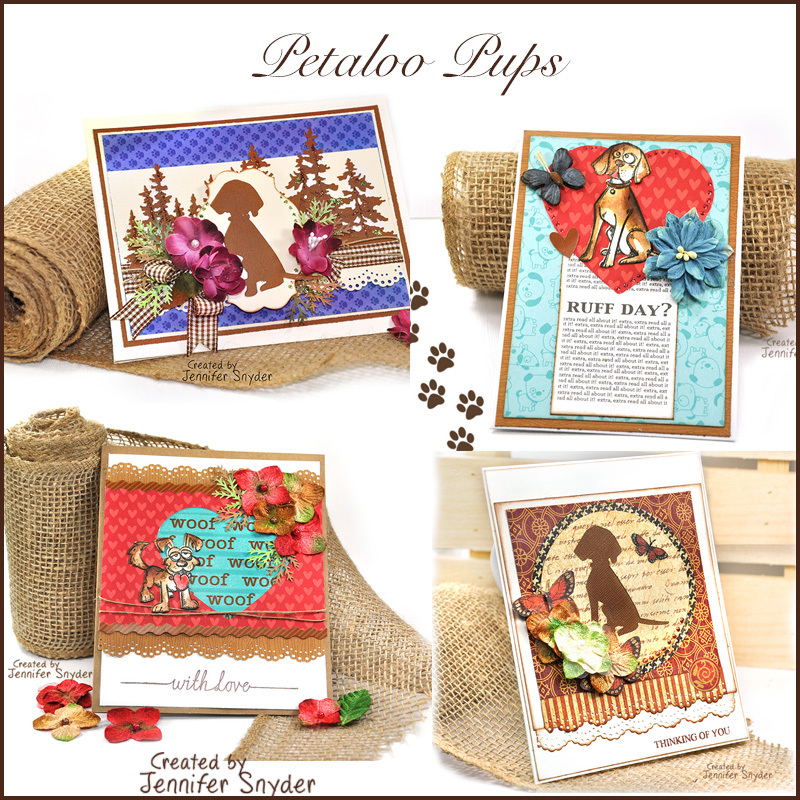 Yesterday I posted my dog cards. 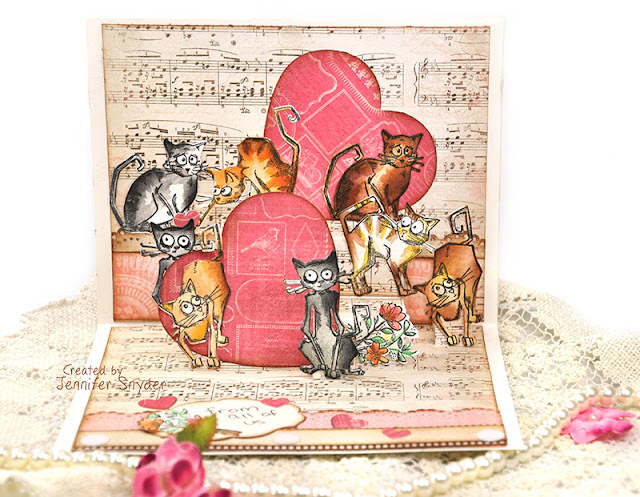 Today the cats get their day in the spotlight. I had to separate the two because if I didn't, I'd have tails and fur a'flyin. Let's just say my cats aren't the best at sharing space with dogs. You can find the dog post right here, complete with a quick step-by-step for one of the dog cards. 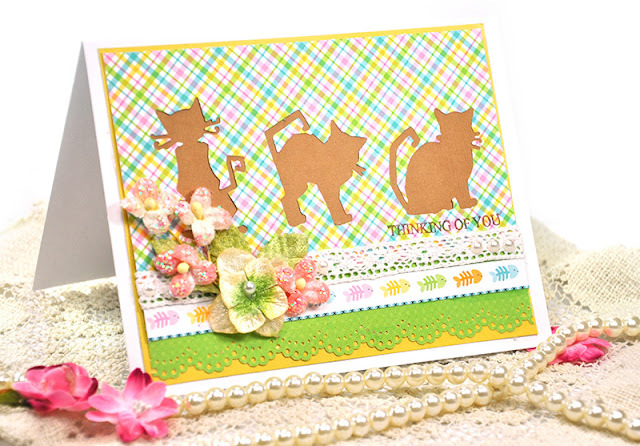 You can also find some of the cat and dog card sets available in my ETSY shop right here. 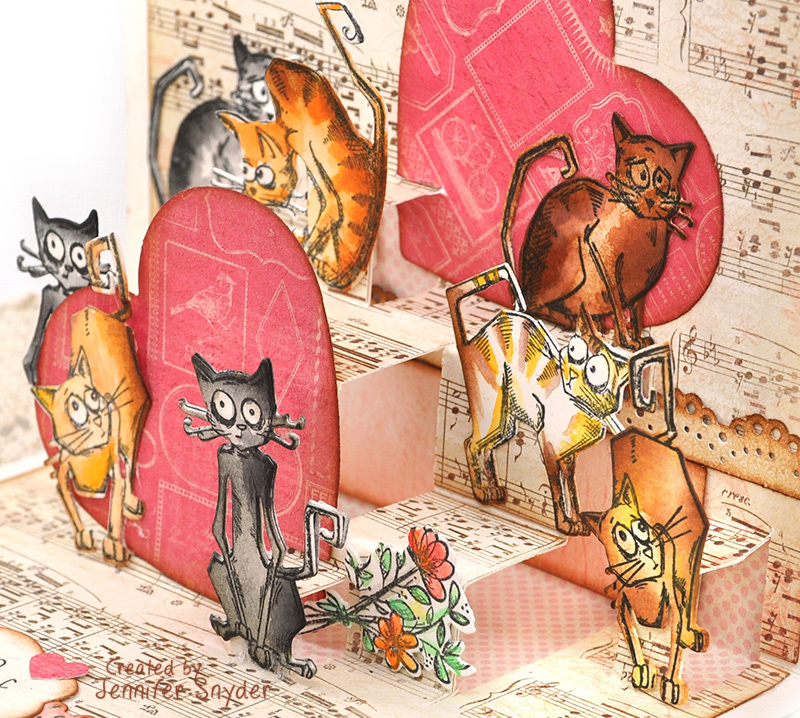 The cat cards are here. This is a pop-up card I created for my husband. I added gorgeous Petaloo flowers to the front of the card but left the inside unadorned because I wanted it to close flatly to surprise him. 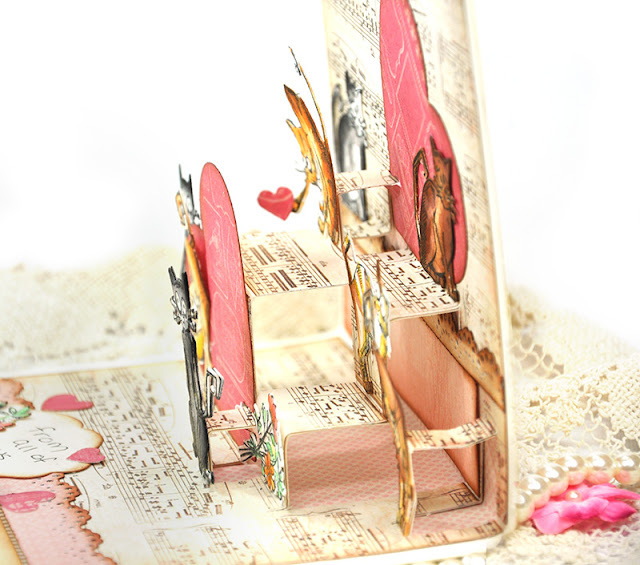 This is the first pop-up card I have made so he was most certainly surprised. 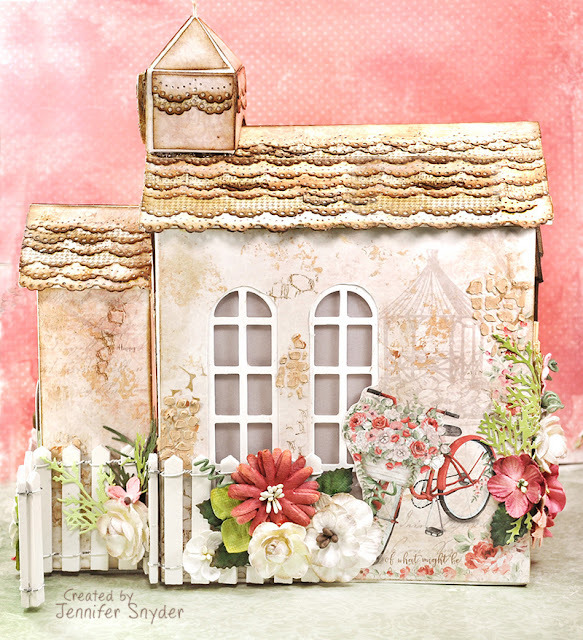 Petaloo Botanica Collection - Chantilly Mixed Blooms - Mauve. Aren't they just spectacular? I used a super old collection for this card - My Minds Eye - Lost & Found Collection. And look at all these darlin's staring at you. 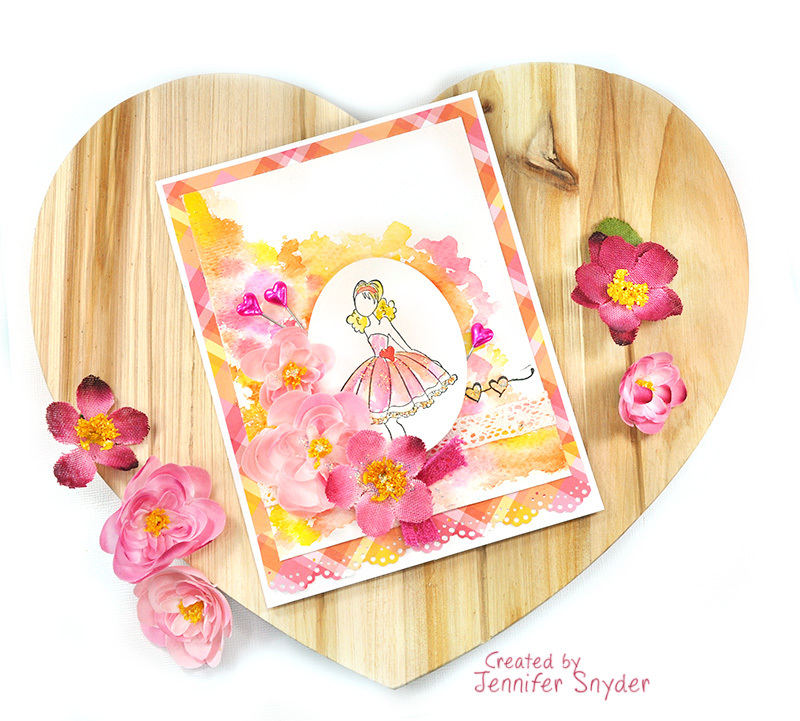 This card features a new flower -Fairy Blossom Branch (code 5016-101). They are sweet delicate velvet flowers with a little sparkle to them. Look for them to ship soon! I also used the Petaloo Textured Elements - Briar Rose Canvas in Red though I chose a flower with a bit more pink from the package. This is my next card. Sweet and simple. 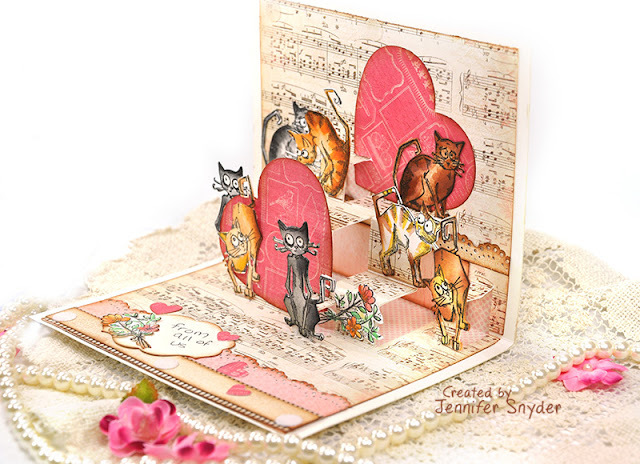 I let the Petaloo flowers and cat silhouettes stand out on this card. The cat silhouettes were made using the Tim Holtz -Crazy Cats and Dogs dies and accompanying stamps. I punched some cats out and really loved the negative space creating a delightful silhouette. The soft Petaloo flowers on this card include the newly released -Fairy Blossom Branch (code 5016-101), the green flowers from the package of Petaloo Chantilly Hydrangea in Red and some delicate Petaloo lace trim, Petaloo Crochet Lace Fancy Trim -White . 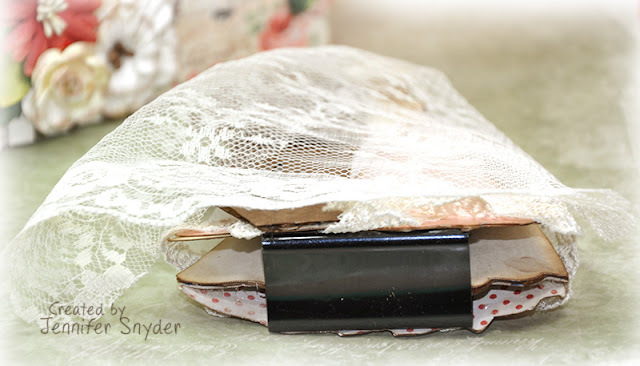 I used the Petaloo Crochet Lace Fancy Trim -White as a border strip. 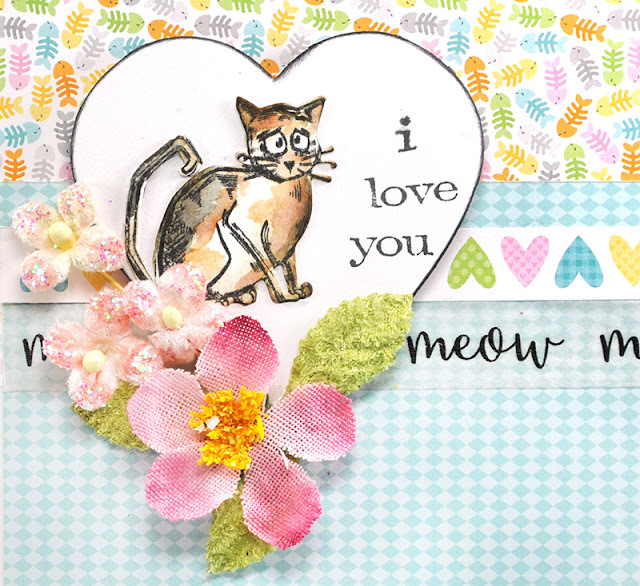 This is the last card and a simple but graphically fun card. 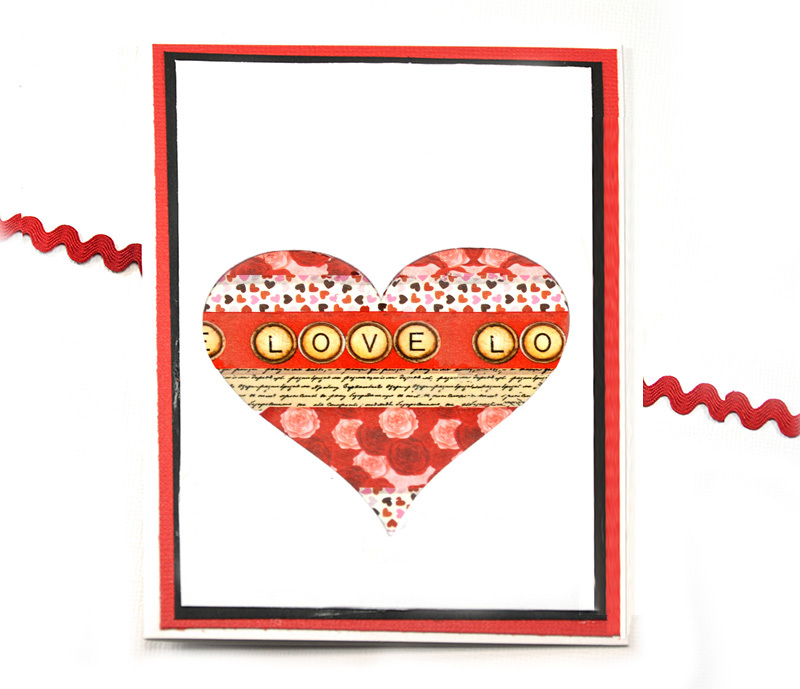 It's a shaker card with washi tape used as a background. This card also has the Petaloo Crochet Lace Fancy Trim used as a border. 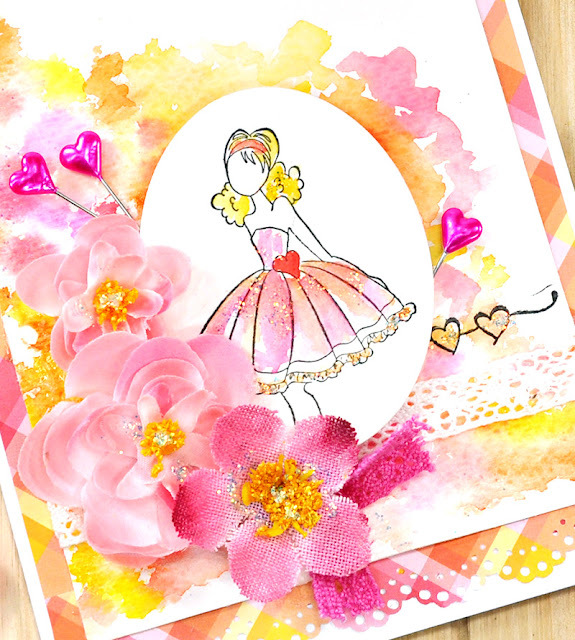 I decided to use some of Petaloo's Jeweled Florettes in pastel colors - they are flat flowers that resemble the flowers on the patterned paper. I felt the shaker card was bulky enough to send through the mail - the flat flowers were a great alternative and still added a bedazzled element to the card. Even more fun? This set of 3 crazy cat cards are available in my ETSY shop. See the listing here. These are just purrrfect for the crazy cat lover, like myself....or to say hello, wish someone a great day, or even sadly to send condolences when someone loses a beloved amazing furbaby. Those pet condolence cards can be hard to find and yet so very necessary to send at times. Look for the new releases like the Fairy Blossom Branch (code 5016-101) I shared on the blue kitty "I Love You" card in this post. Thanks for stopping by and have a wonderful Day filled with love from your family, friends and Petaloo! PET-aloo is celebrating pet days. Click here for a chance at some prizes. 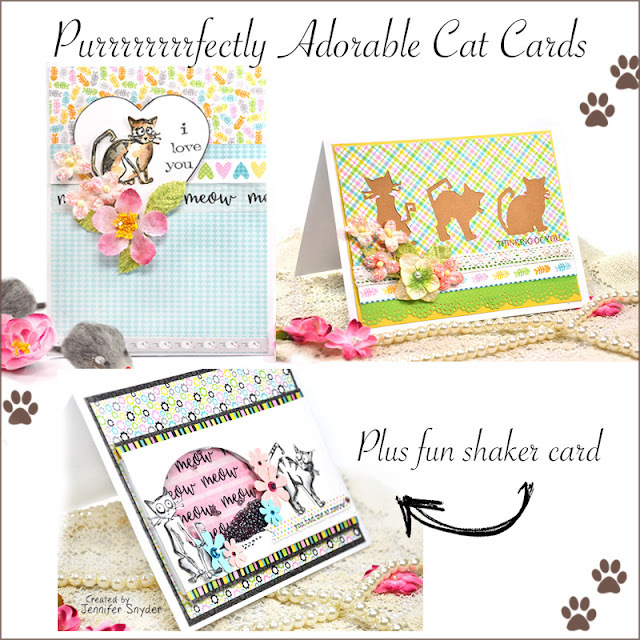 Now to avoid fur-balls flying in the air, I decided to post my cat and dog cards on separate days. In my house, the cats will not put up with any dog shenanigans. Yes I know that many households around the world have dogs and cats living in blissful harmony. That's just not the situation at my house. My cats may not love dogs, but I certainly do. 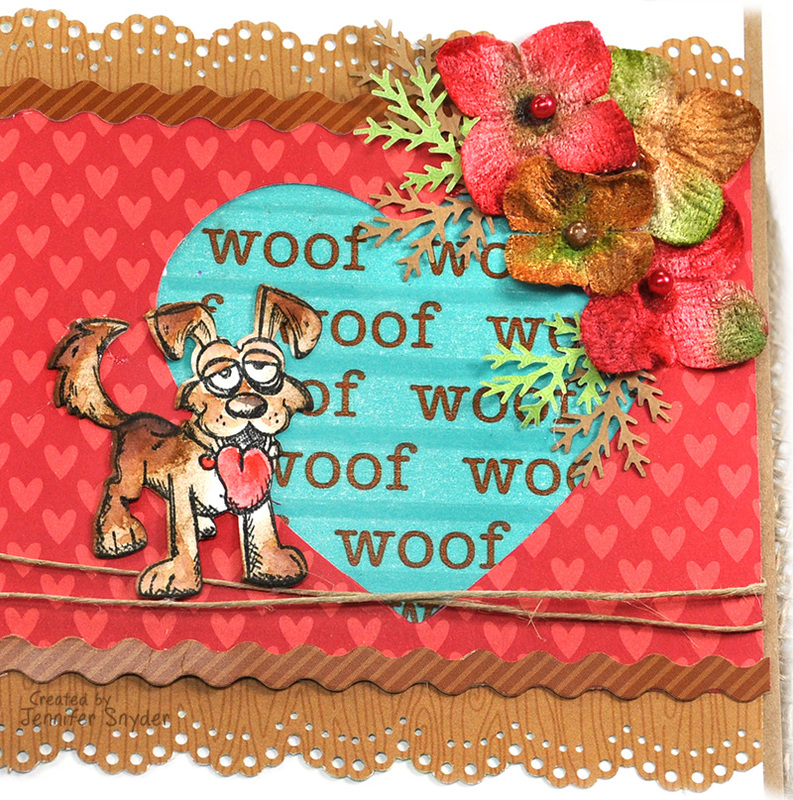 So to get even, I am posting the dog cards first. Cats have to wait their turn and are featured here. I had so much fun that I created a variety of cards and even a quick step-by-step for one of them. This little pup is my first card. 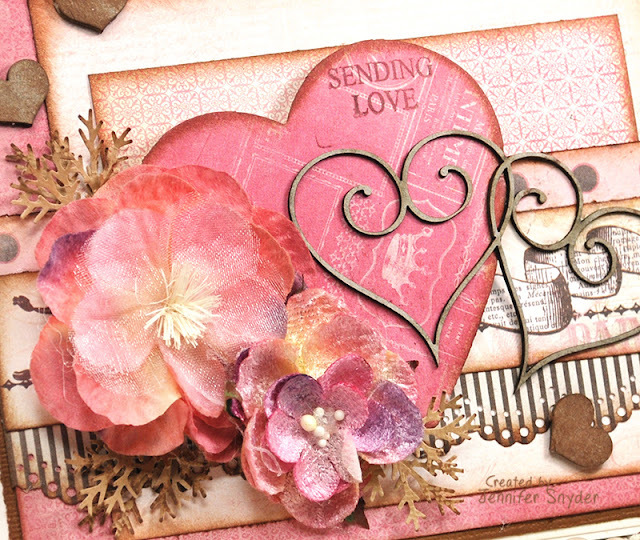 I used a few sizzix dies by Tim Holtz for my cards. 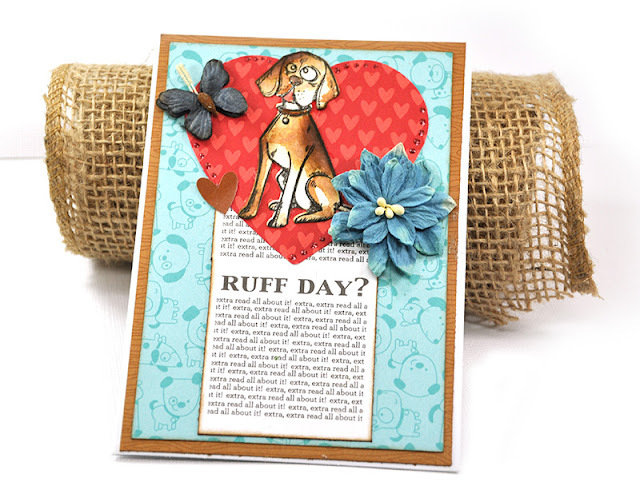 This one uses the negative space from the die. I thought it made a lovely silhouette. 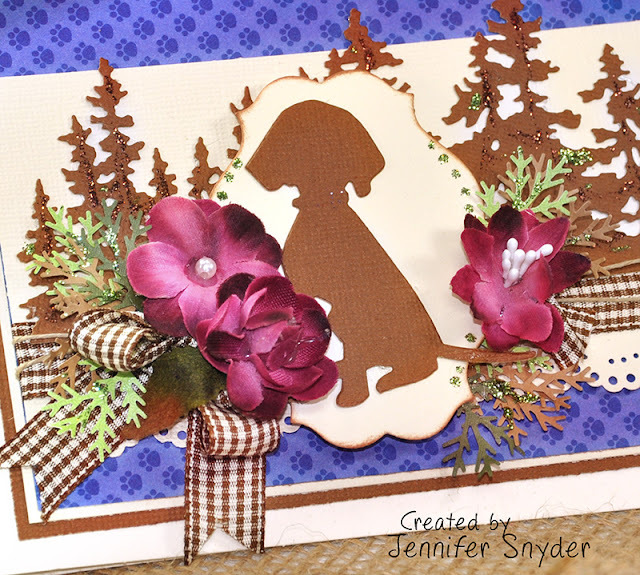 The Petaloo Botanica Baby Blooms in Purple are so striking with the purple/blue of my paper - which is Doodlebug Design Puppy Love. 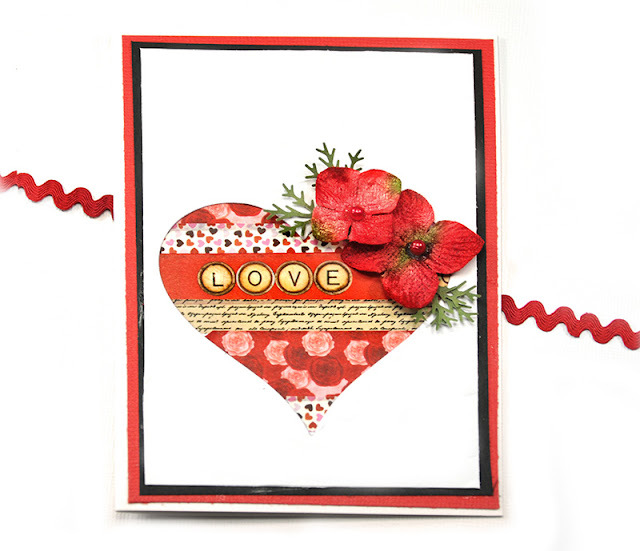 This is my second card with a tiny DIY step-by-step. Before I move on to the DIY instructions, I will tell you a little about the card. 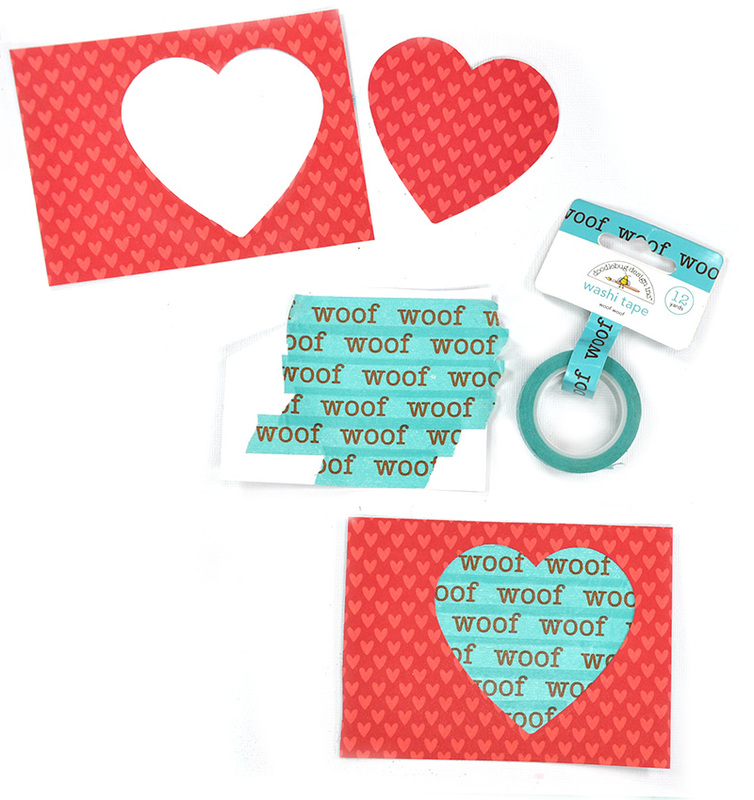 The papers are once again Doodlebug Design Puppy Love as is the teal and brown "Woof" washi tape. The flowers I chose for this card were Petaloo Chantilly Hydrangea in Red. The red and brown hydrangea's looked marvelous with my crazy brown pup. 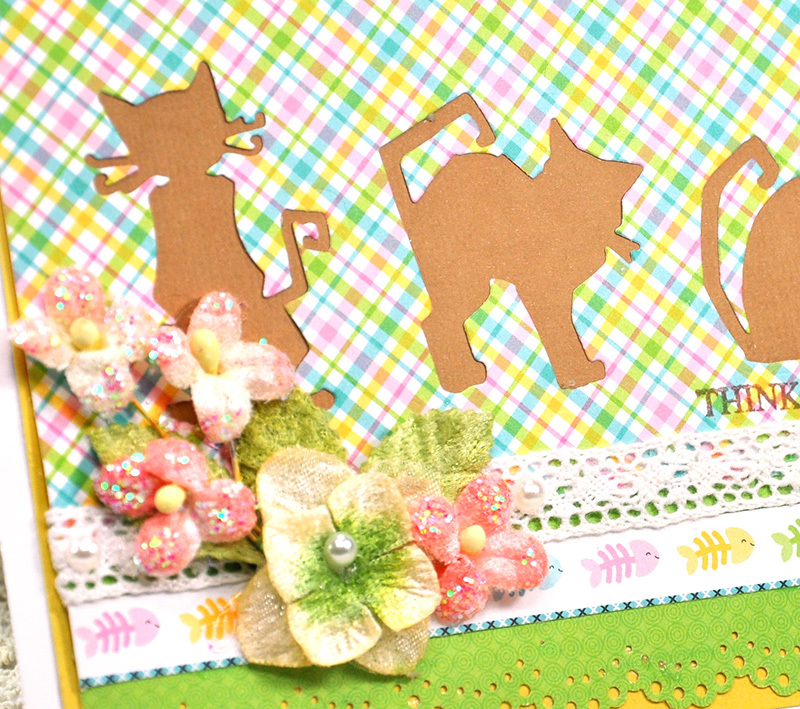 Die or punch your choice of cardstock or patterned paper. Cover a plain piece of cardstock with washi tape. 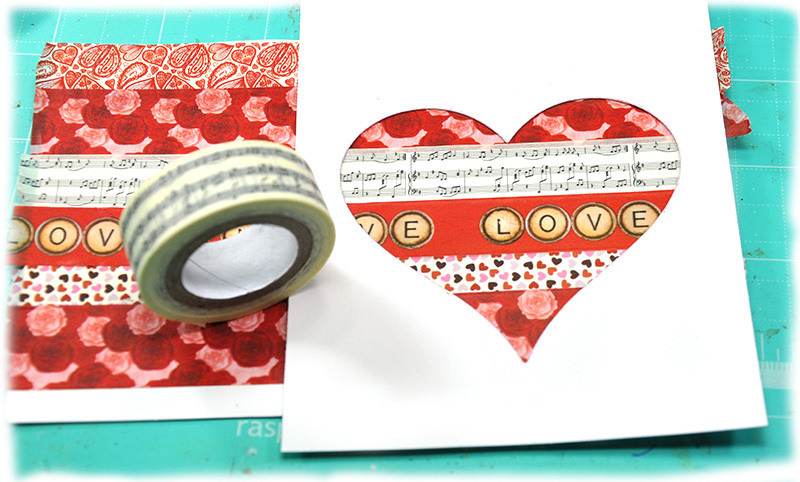 Place the die cut over the washi tape...and continue on with your embellished elements. The words on this card make me laugh. "Ruff Day?" Way too darling. This puppy is waiting to cheer you up. 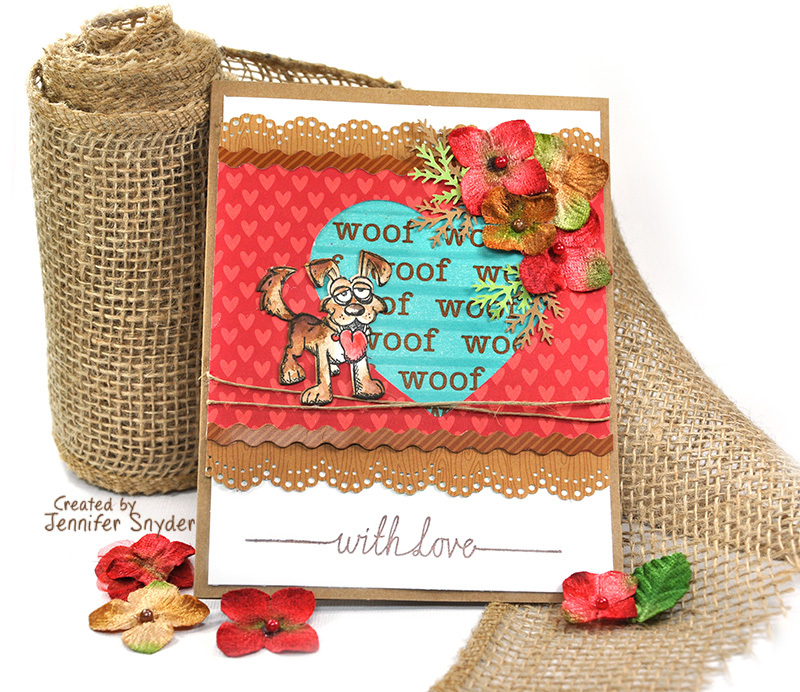 My last card of the day is the only card that doesn't use Doodlebug's Puppy Love collection. This is Graphic 45 Botanicabella Collection - full of warm browns and oranges. I thought it would be perfect for the negative image of the Crazy Dogs die ( Sizzix and Tim Holtz). 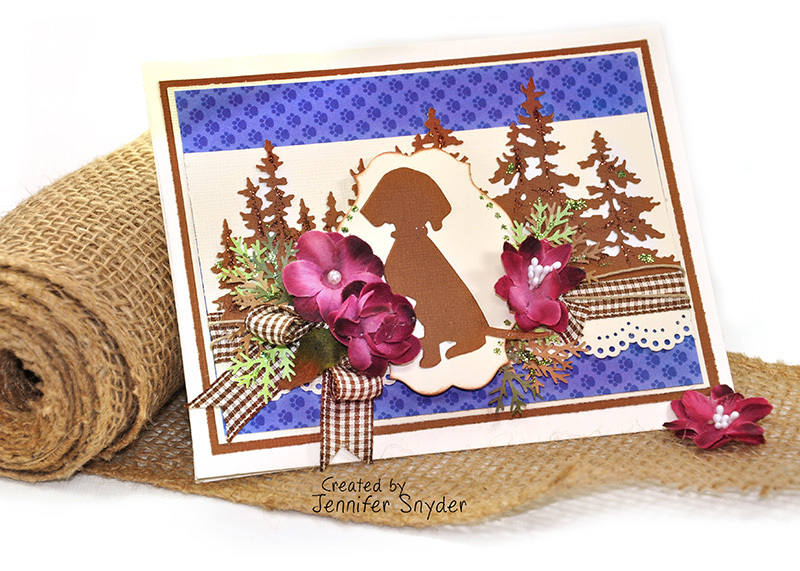 I used the Petaloo Chantilly Hydrangea Red in this card as well, but focused on the green and brown flowers in that package - I used the red flowers on my first card above. I'll be back tomorrow for Cat Day! I made a few cards to send to family members to show I appreciate and care about them. 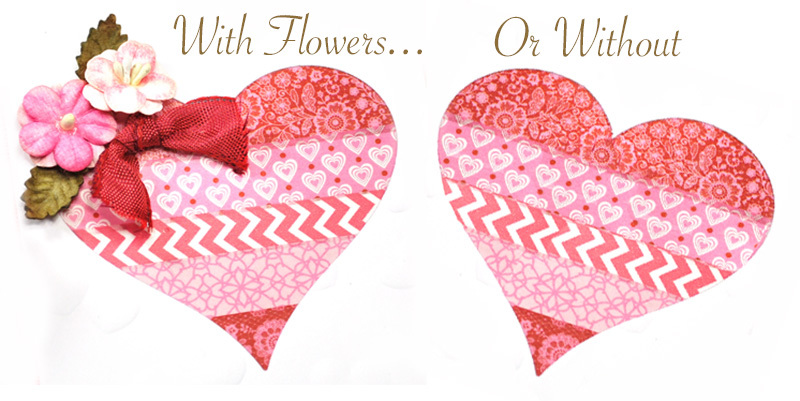 A Valentine's card doesn't need to be mushy. Mine were simple, quick and the message I wrote on the inside was also a quick note to let them know I appreciate and value them. Lately I have been obsessing over washi tape. It's fun and it can give any project a pop of color. 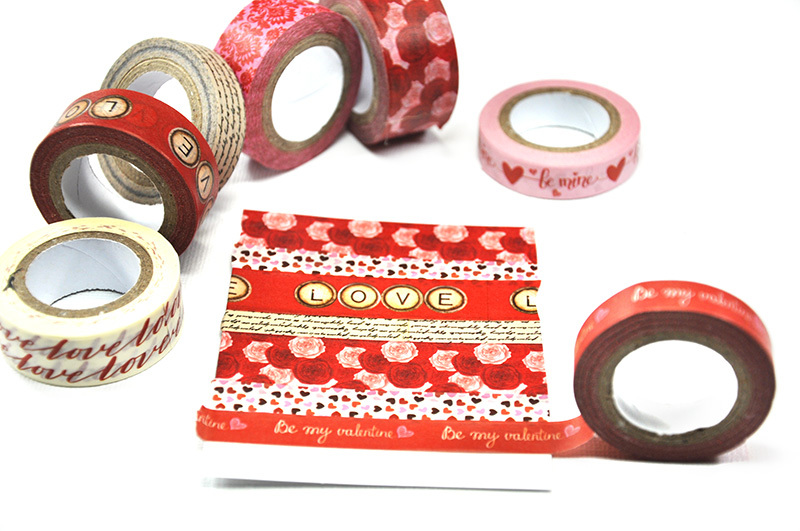 Washi tape is the main product on my cards. I bought my washi on sale at Michaels. 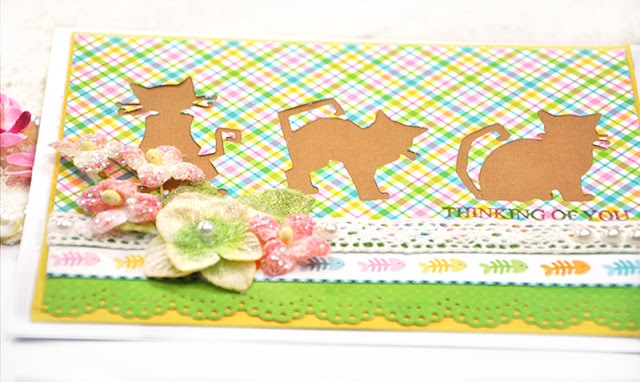 Start with a die or punched piece of cardstock. 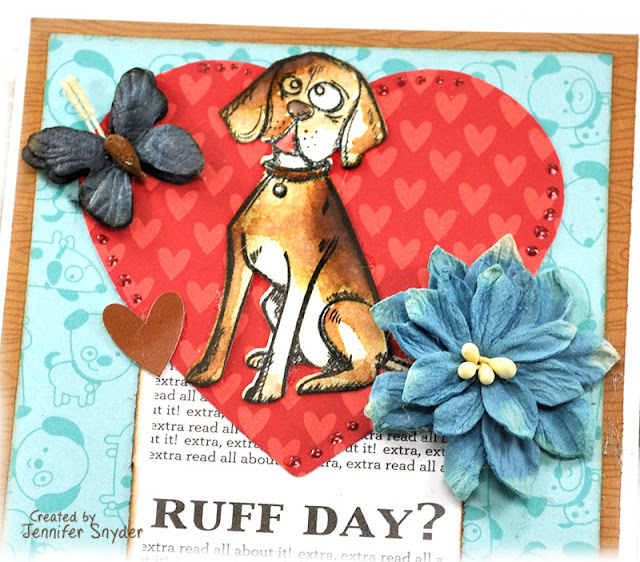 I used a simple heart die that I like. 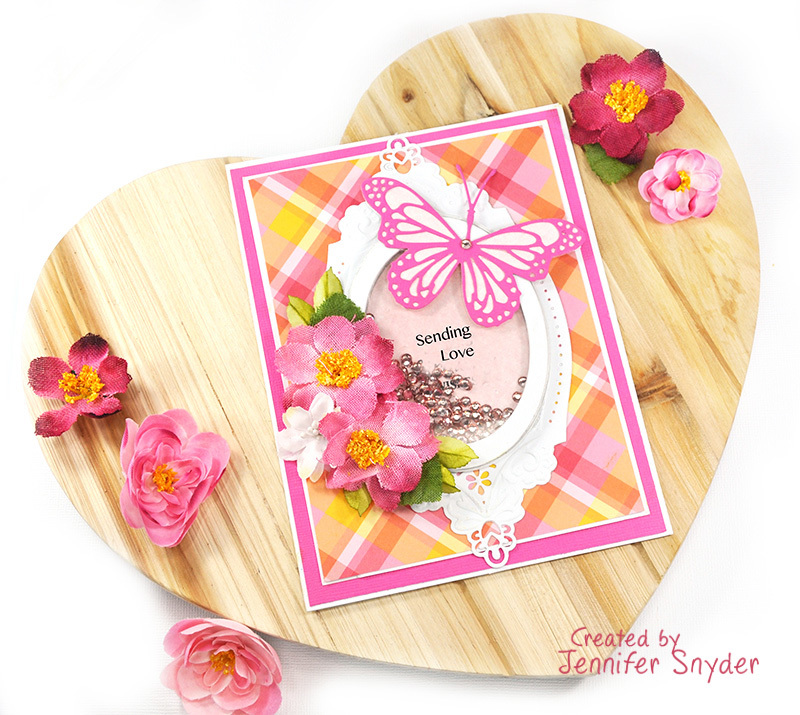 It's from Cheery Lynn and it's the Heart Shaker Die Set. 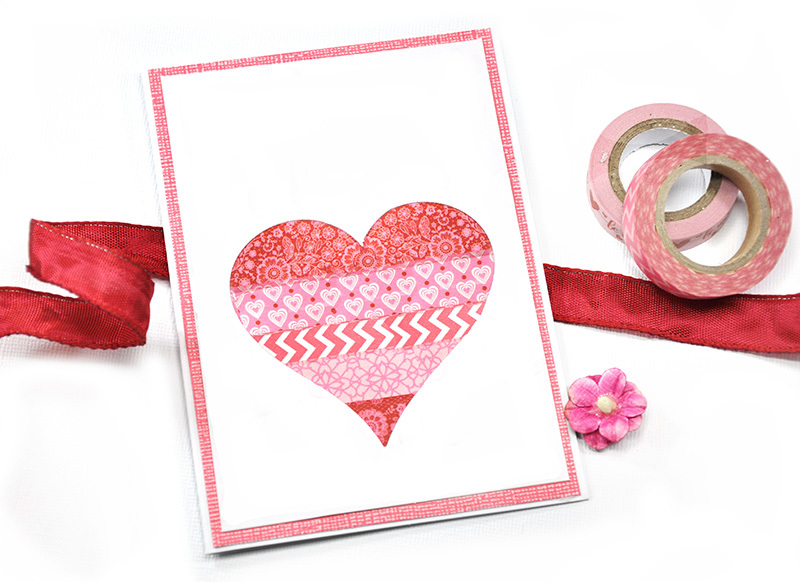 Cover a blank piece of cardstock with strips of tape. Once satisfied go ahead and glue the punched cardstock to the washi covered cardstock. 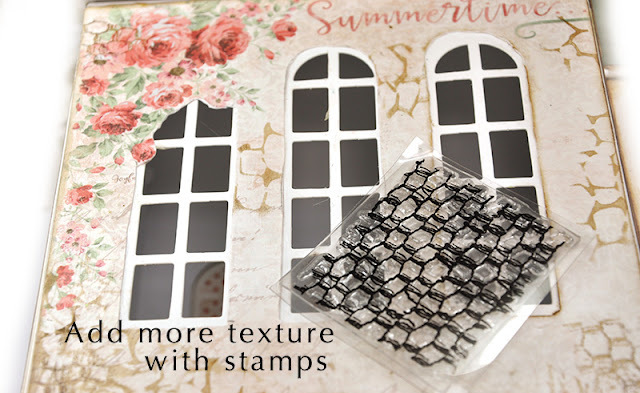 You can keep it simple and call it done or you can add other embellishing elements like flowers, sentiment stamps or whatnot. 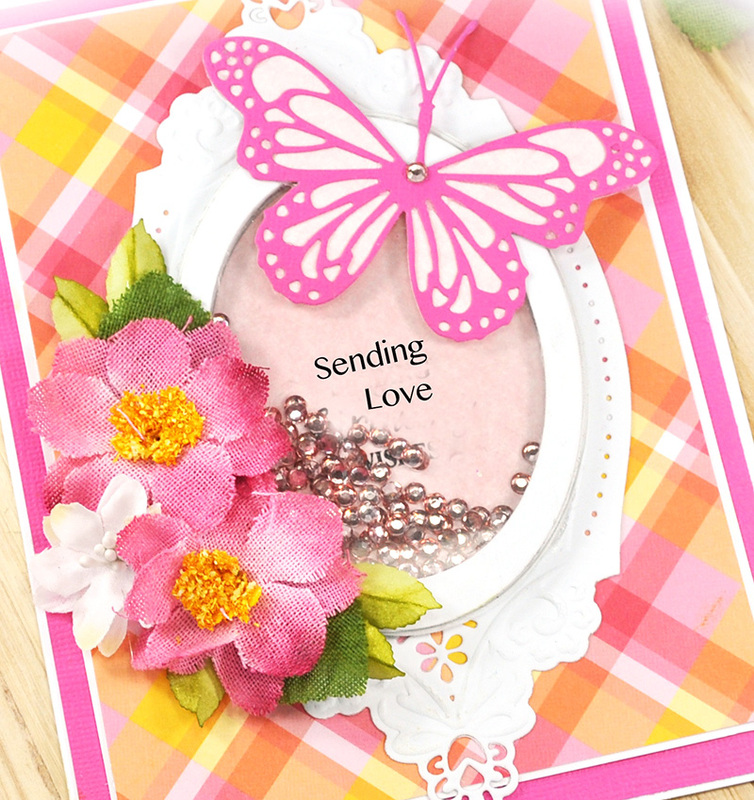 I chose to add Petaloo flowers to some of my cards. Petaloo Chantilly Hydrangea Red . 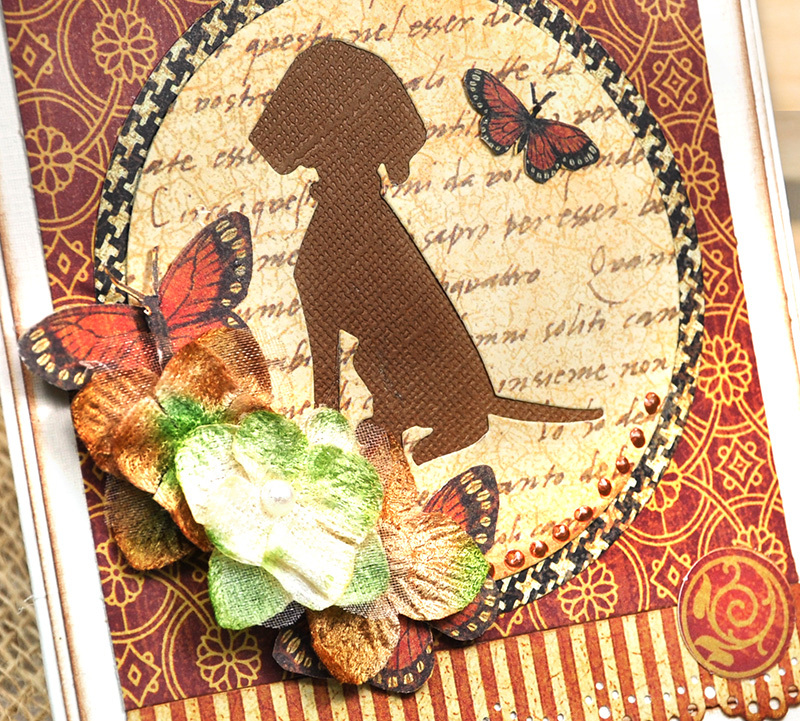 These flowers have a gorgeous bit of green and I loved how it looked with my bold washi. 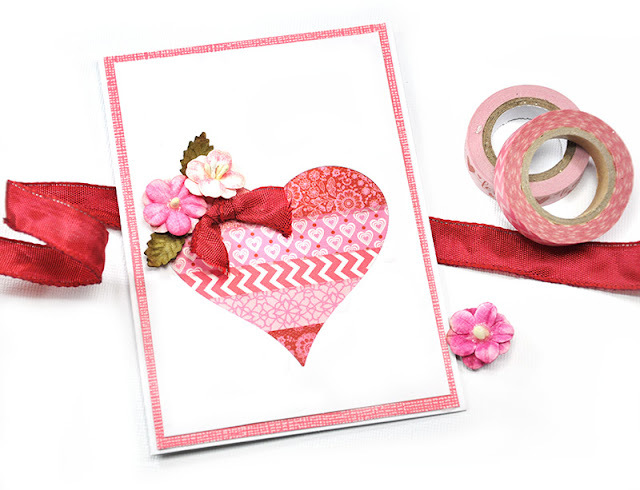 Next - a pink card using the cheery pink tones of washi I snagged. For this card, I chose to use Petaloo's Darjeeling Teastained collection - Petite Blooms in Pink. 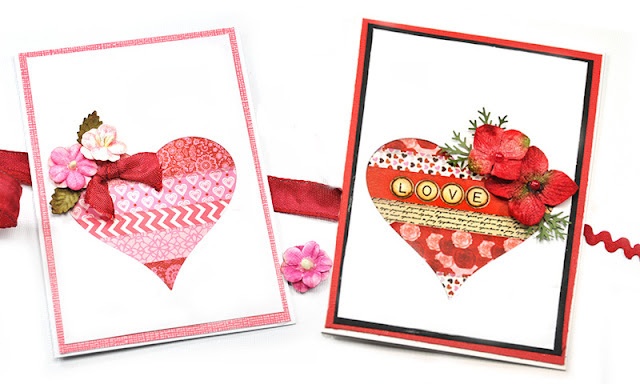 Sharing some Valentine's cards for February, the month of sweetness. I have two cards adorned in pink - both gussied up with Petaloo's gorgeous pink flowers. I think the happy cheery pink is a perfect balance to the dull chill of winter. 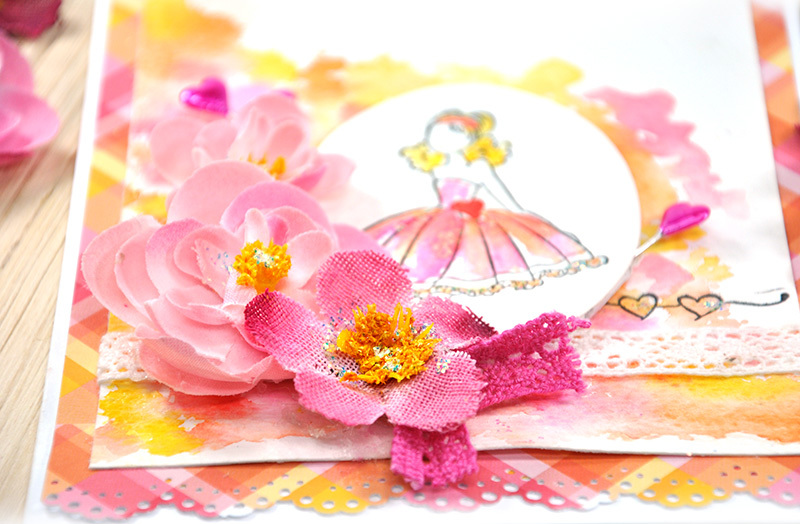 and the new Petaloo Ranunculus flowers in pink ( aren't they fabulous!). The Ranuncula's will be shipping soon! 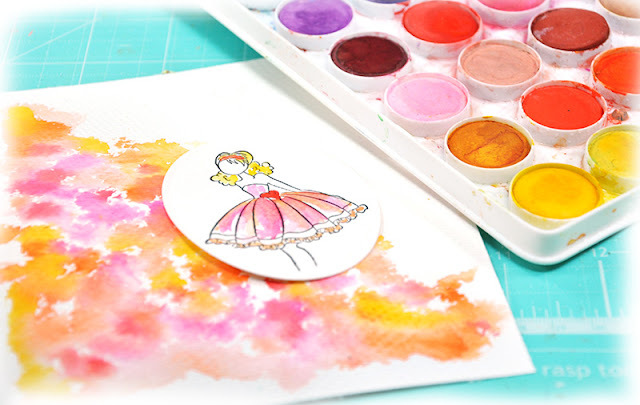 I stamped an image onto watercolor paper so that I could paint the dress. I used watercolor paper because it is heavy and will absorb the water from the paints. 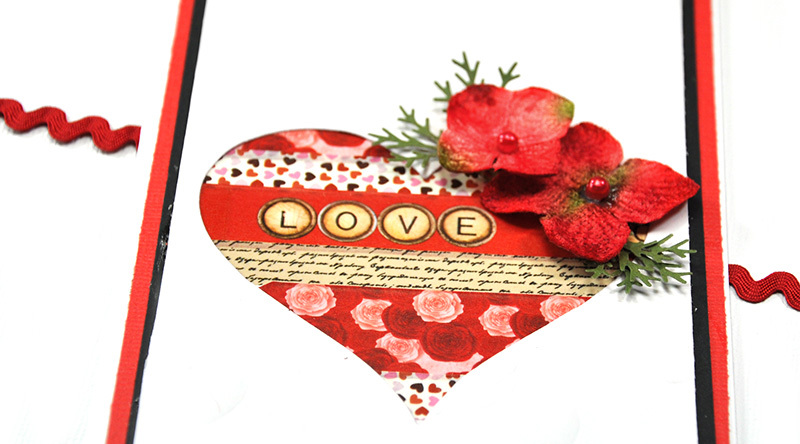 Regular cardstock or patterned paper is not as durable when water is applied and tends to get mushy and disintegrate. I selected an ink that would not bleed or run when water is applied. After my image was stamped, I simply blotted watercolors onto the paper. Easy! No real skill needed. and the new Petaloo Ranunculus flowers. The new collection of flowers is absolutely amazing and better yet...shipping soon! My second card is equally bright and cheery. It's a shaker card. Who wouldn't love to receive a shaker card in the mail? 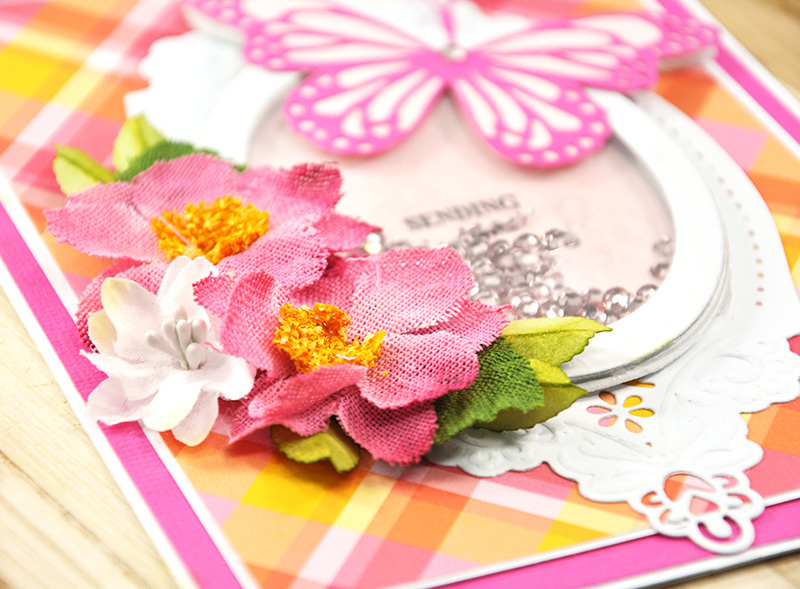 The flowers make quite a statement on this card I think. 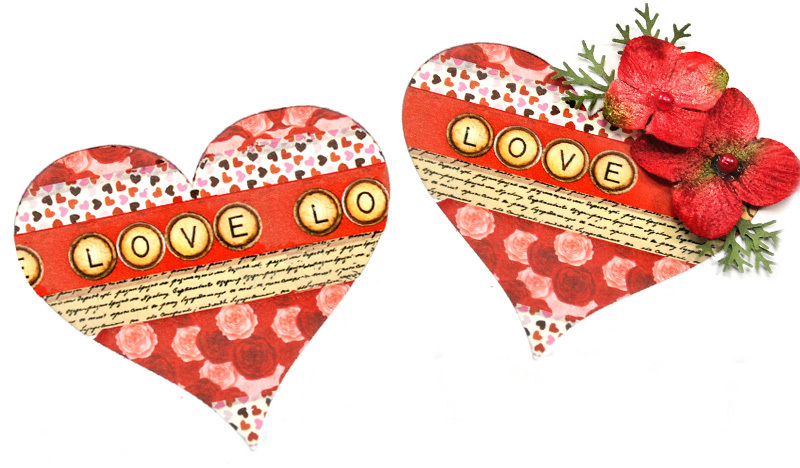 Thanks for stopping by and have a wonderful Valentine's Day filled with love from your family, friends and Petaloo! Sharing a fun piece of home decor I created to celebrate February, the month of love. 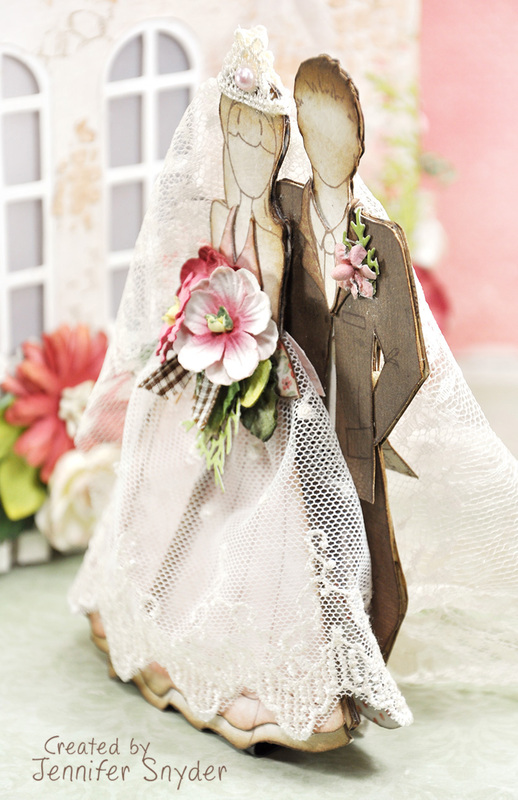 Nothing says true love like a wedding. 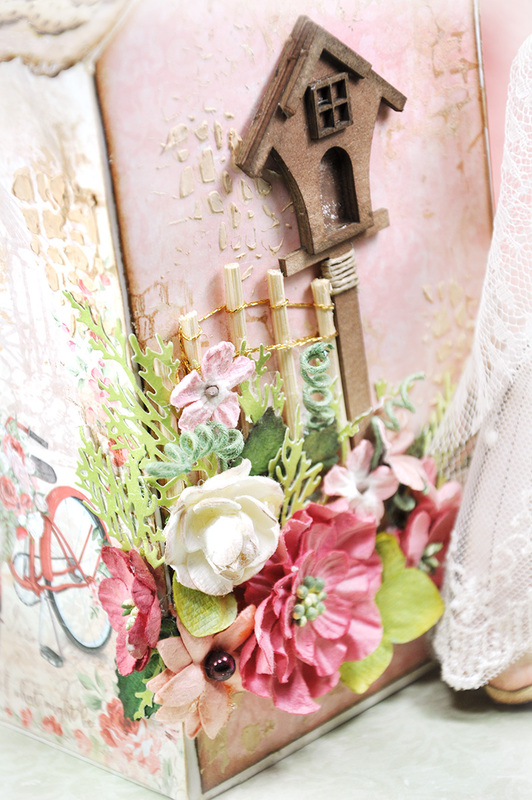 And nothing adds beauty to a project like Petaloo flowers. I have added Petaloo gardens all around the chapel for warmth and charm. 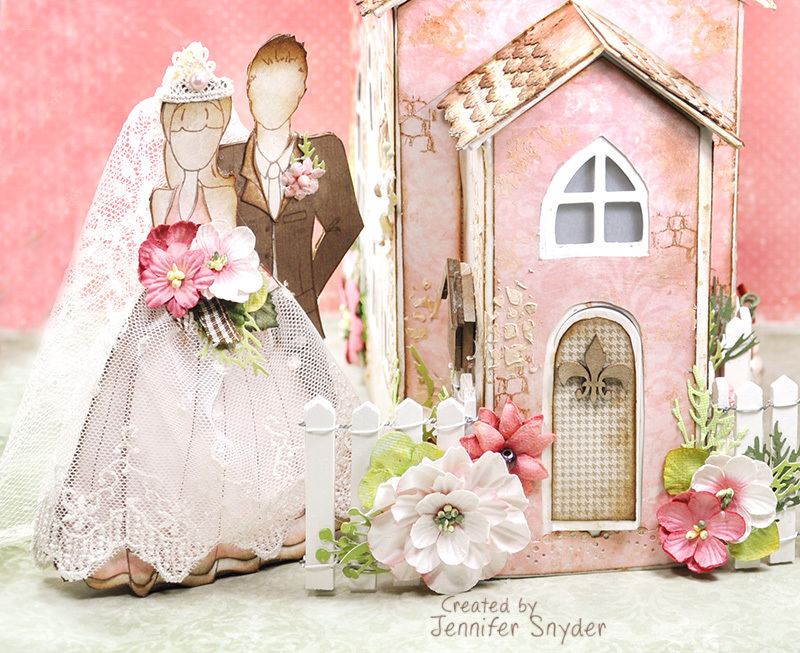 This project was really fun to create because I paired some of my all-time favorite products: Maja Design Papers, Petaloo Flowers and Prima's Julie Nutting Doll Stamps. I hope you enjoy my little photo session with the happy couple. If you scroll down a bit, I'll show you a few tips on how I created both the chapel and the bride and groom. In this shot, I've placed the newlyweds in the back garden. Here is a close up of the back garden complete with a trellis made from wood skewers and a chipboard birdhouse. 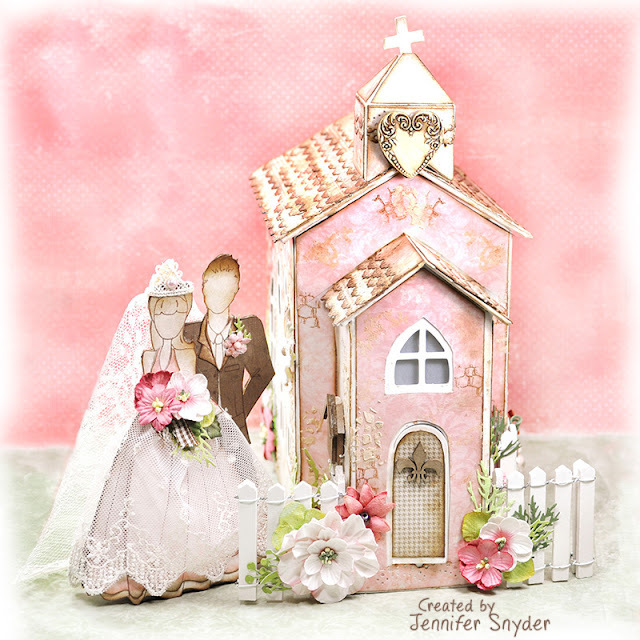 I used Maja Design's Summertime paper collection to create both the chapel and the bride's gown. 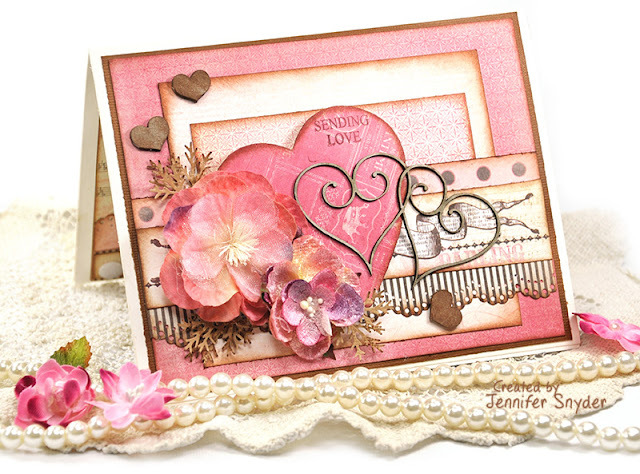 This collection is soft , warm and perfect for a romantic day. If you skip to the Maja Design blog, you'll see the chapel featured in the monthly Mood Board . 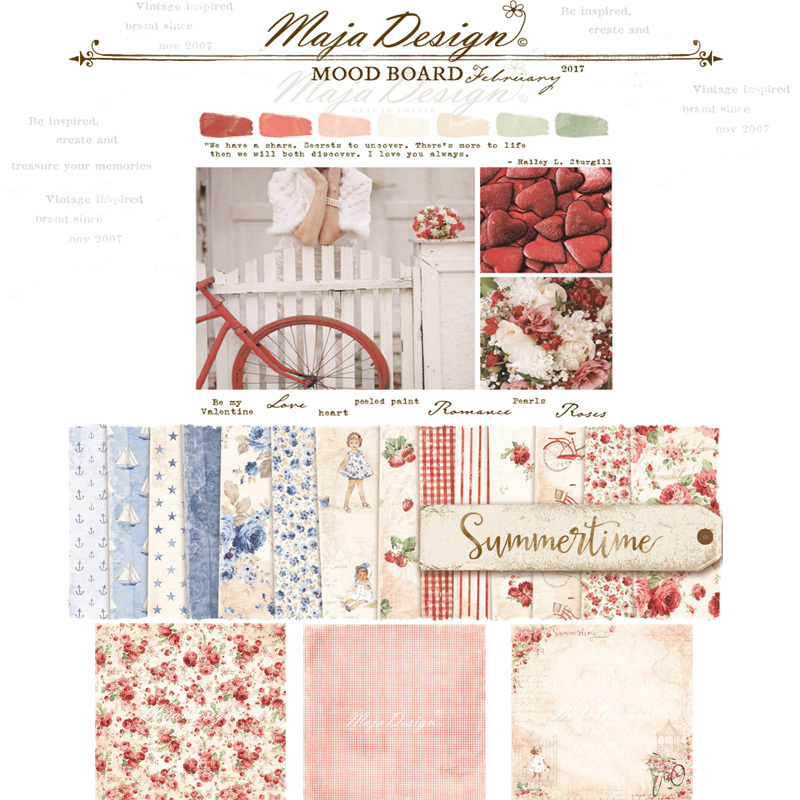 Maybe you'll decide to play along with the Mood Board challenge this month. Here is a photo of the Mood Board and the Summertime paper that I used. You can see how wonderfully it fits the challenge. This is how the chapel looked before it was covered and decorated. 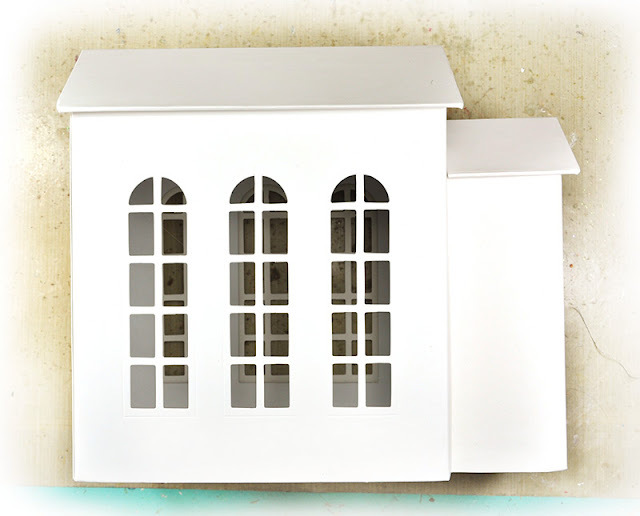 This is a cardboard house that I purchased on clearance the end of the Christmas season from Michael's. 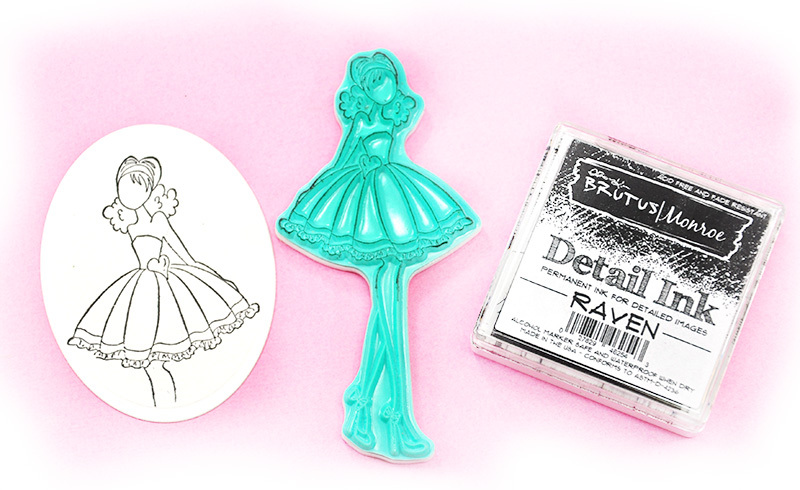 I am always watching for these types of little end-of-season treasures when I shop - at a discount of course. I started covering the roof first, one punched strip at a time -starting at the bottom and working my way up, as roofing shingles would typically appear. Each shingle strip is securely applied to the chapel using a coat of sealant on both sides. 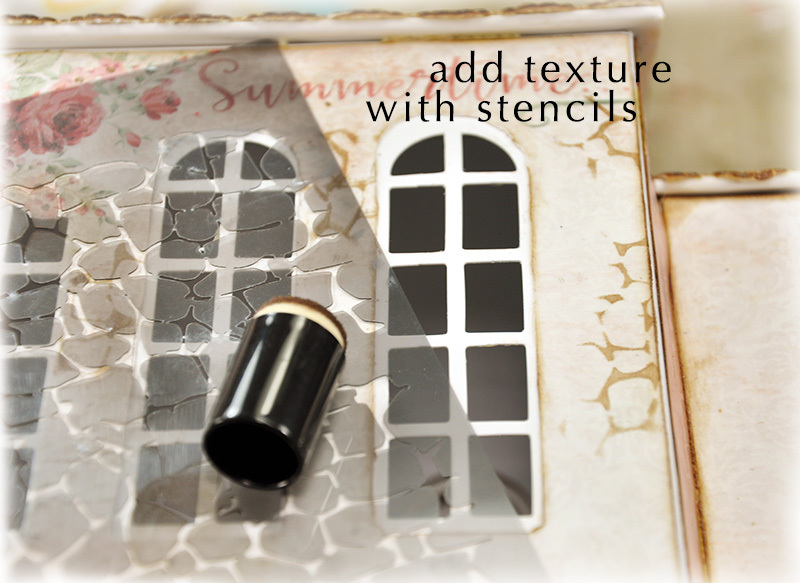 I used matte finish Mod Podge. There are other options as well- clear gel medium, or a thin mixture of white glue and water painted on each strip. 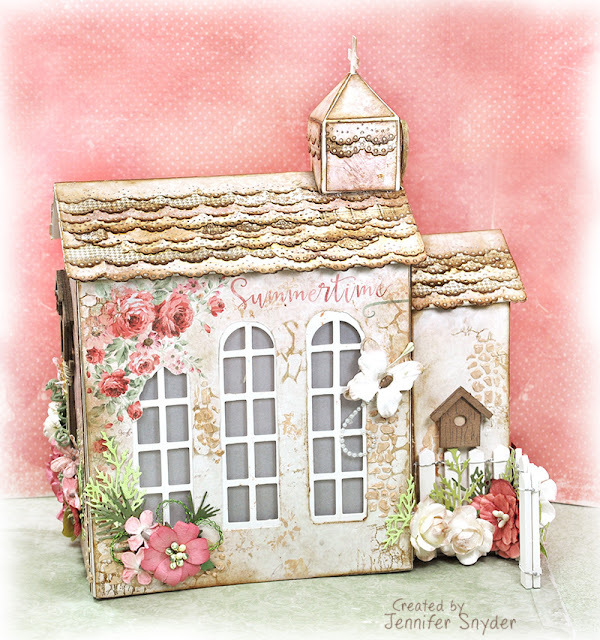 I created this piece for the Petaloo display booth at Creativation (formerly known as CHA)held this past January, so the Mod Podge protected the paper from fingerprints, ripping, peeling and actually provided more support to the cardboard structure. It helps create a durable decor piece. 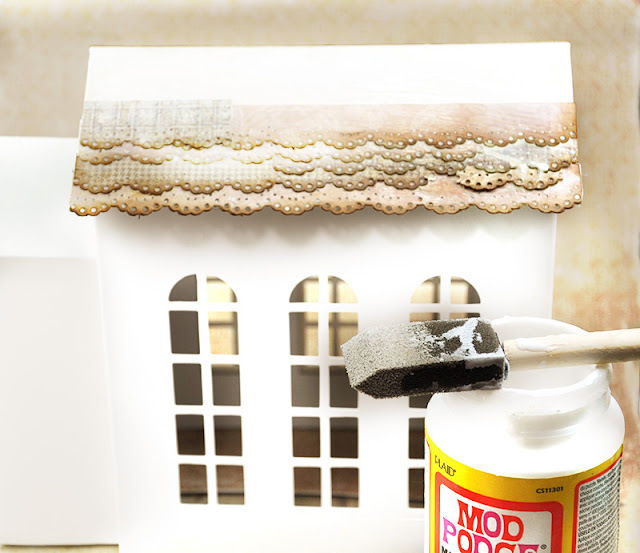 After the Mod Podge roofing was dried, I moved on to add some texture to the sides of the building. The next few photos show how I combined stencils, stamps, and paste ( or heavy gesso) to create the appearance of brickwork. Below is another side view of the chapel. This side has a sweet Petaloo Darjeeling Butterflies - Teastained in cream. 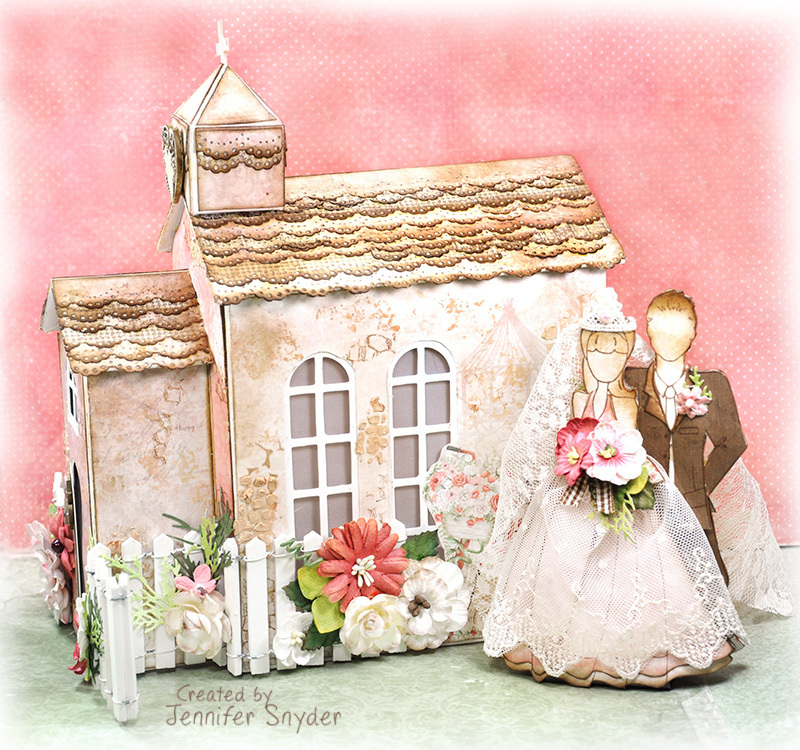 Next , I'm moving on to showcase my bride and groom. 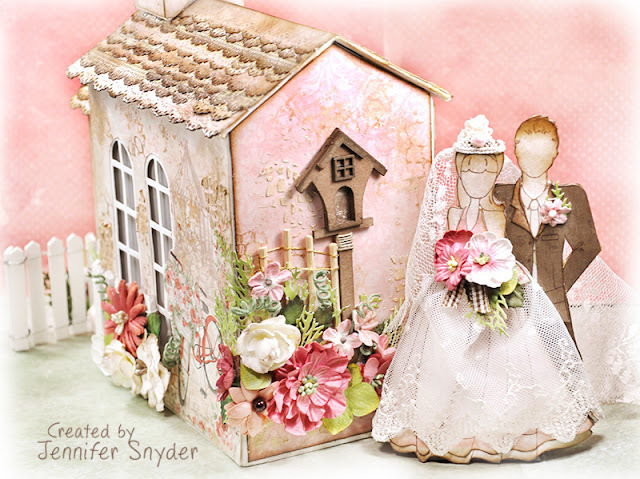 The beautiful blushing bride is carrying a Petaloo floral bouquet made of Petaloo Penny Lane - Forget Me Nots - Antique Red . The handsome groom has a boutineer made of Petaloo Mini Daisy Petites Pink . Now I'll share some of my tips for making the bride and groom from Prima's Julie Nutting Doll Stamps (Camille and Adam). I love making the dolls 3-dimensional so they stand. 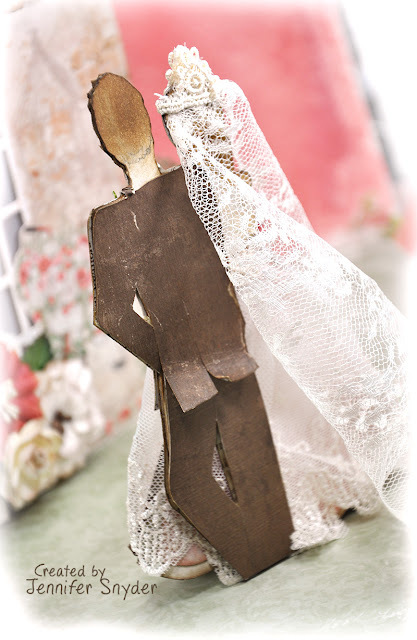 I believe I have come up with a very cool and simple doll stand that works nicely for this couple. 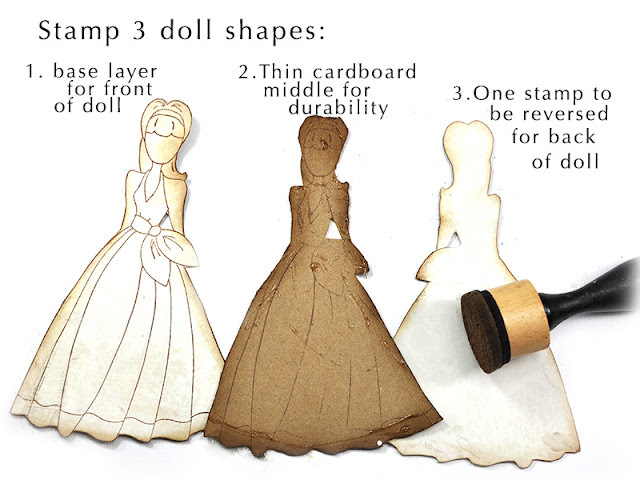 The first step is to stamp several layers for the body, including one layer of thin cardboard (chipboard). I want my doll to stand and be durable - not bendable. This doll has a front and a back that people will see so it was important for me to make the back appealing. 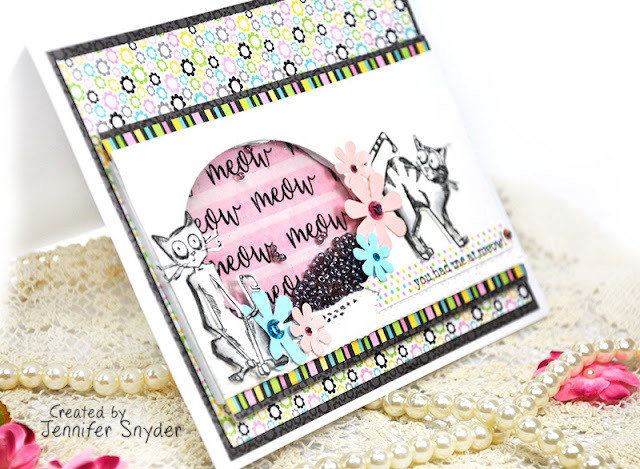 To create the back, I stamped a third image and turned it around to use the un-stamped back side. 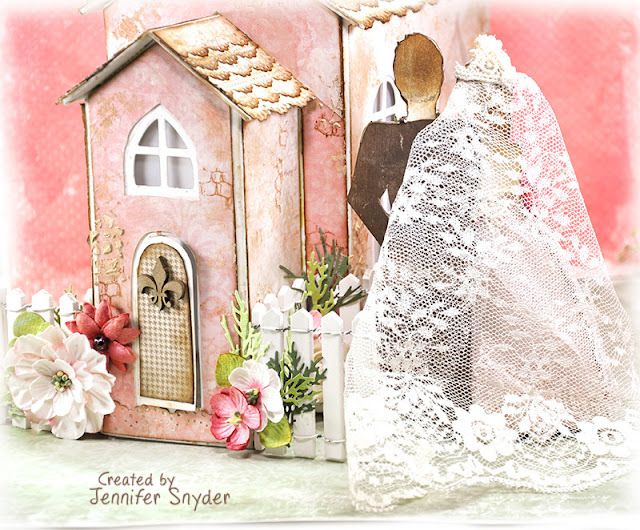 The long bridal veil covers the backside perfectly so no stamping is really needed. Next - I used a large binder clip for the base. I removed the metal handles after the clip was in place. 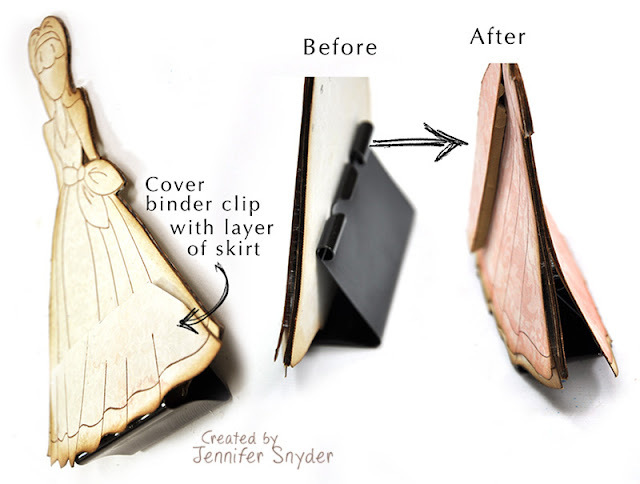 At this point, I was able to cover the binder clip with more stamped layers creating the dress. 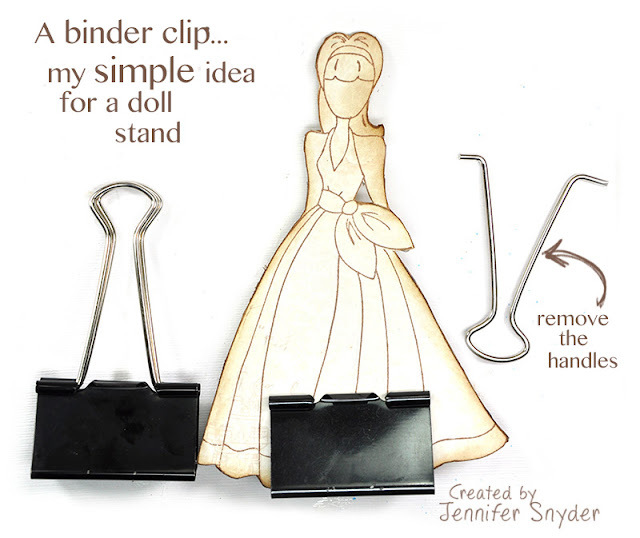 Here is the side view showing the binder clip and how I covered the clip with paper layers. I snuggled the groom up behind his bride and glued them together for life. I covered the backside up with the long lace veil. You cannot tell that the backsides are not stamped. Here is a view of the bottom of the clip. They stand perfectly balanced. Here are some additional photos of the joyful event. More garden shots, and a photo of the front steeple. 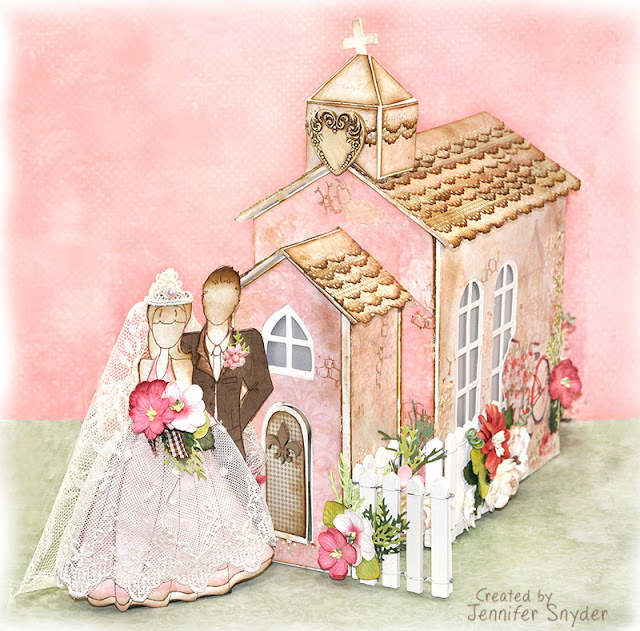 The beautiful heart shape on the steeple is a resin piece that Petaloo made a few years back. I had been saving it for a perfect occasion. Thanks for taking time to stop here. You can find more Petaloo products listed here, and we invite you to join and LIKE us on Facebook right here. The new collections will be available soon. You can see the Magnolia sneaks here, Garden Roses here, and adorable Glittered Bugs ( Butterflies and Dragonflies) right here.